It is strange how things can go. Several months ago I was writing an article about the different Corpus Hermeticums and the Hermetic scriptures. Just having finished that article I buy a brandnew book appears and the writer also has a list of Hermetic texts. Jacob Slavenburg found Hermetic texts among the so called Greek magical papyri; are the texts in the papyri in which Hermes is named. Only weeks later I was in my usual second-hand bookshop (that I visit every week) looking through the ‘theology’ section that I didn’t visit often before and my eye fell on the backs of two books saying “Abrasax”. Already figuring that these books were a bit misplaced in the section, I hoped for something Gnostic. Yet, the covers say: “Ausgewählte papyri religiösen und magischen Inhalts”, or in English: “selected papyri with religious and magical content”. You can imagine that I had to think of the Greek magical papyri and indeed!! The work is coverage of lectures and is divided in two books. It has selected texts from the Papyri Graecae Magicae (PGM) in the original language (Greek of course), German translations and a lot of elucidation, resulting in a very scholarly work. Unfortunately the texts are only an “Auswahl”, so not all papyri are included and of course none of the Hermetic texts are in my books. The two books are written by Reinhold Merkelbach and Maria Totti (1990) and based on the complete publishing of the papyri by a Richard Wünch and Karl Preisendanz (published 1928-1931). My two books are called “Abrasax” to both link with and discern the work from the book about the PGM of “Abraxas” by Albrecht Dieterich from 1891. Crossing the internet for more information, I ran into other lenghty translations with PGM texts at Hermetic.com. Funny enough, the texts there are just other than the ones in my book, but also here none of Slavenburgs Hermetic PGM texts… Looking further and in the texts that I now have, questions arise over the list with Hermetic PGM texts of Slavenburg, because he forgot to mention the line-numbers of the texts he refers to, since most papyri have more texts. My books and internet printouts have only partial papyri, such as VII lines 505-528. Most of the time there are no titles and furthermore, there are more texts in one papyrus and for example VII 505-528 is one of such texts. So how did Slavenburg come to his titles and why didn’t he mention the lines that have these titles? Also, I found no references by Slavenburg about the fact that there are at least two well-known Hermetic fragments in the PGM. PGM III 591-608 is the same Prayer of Thanksgiving that can be found both in the Nag Hammadi library (NHC VI.7) and at the end of the long Hermetic text Asclepius (chapter 41b). Also there is a part of the Corpus Hermeticum to be found within the PGM XIII 16-20 is a part of CH XII ! Not to mention the fact that sometimes the information about spirits for the hours of the days, etc. are akin to information in the earlier mentioned Asclepius. I contacted Slavenburg about all this. He says that the only PGMs that he mentioned are those in which Hermes is named and that he indeed forgot to mention the line-numbers, but they will be added when there is a new pressing (an English version of the book is worked at by the way). Later I bought the complete English translation of the PDM and PGM by Hans Dieter Betz and his crew. The introduction has some more information than I had here before. The Hermetic PGM of Slavenburg are still hard to find. “The PGM (Papryi Graecae Magicae) is the name given to a cache of papryi of magical spells collected by Jean d’Anastaisi in early 1800’s Egypt. Hans Deiter Betz, in his introduction to the newest English translation, speculates that these papyri may have been found in a tomb or temple library and the largest papyri may have been the collection of one man in Thebes. However, the exact provenance for the PGM is unknown. Betz states that through literary sources it is known that quite a number of magical books of spells were collected in ancient times, most of which were destroyed. 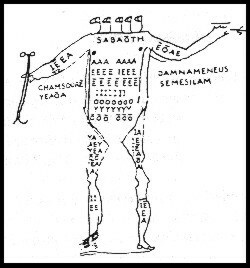 Thus, the PGM are a very important source for first-hand information about magical practices in the ancient Mediterranean.” (also at http://www.sonoma.edu/users/h/holmstrl/EGmagic.html). So the PGM have been written in the time that is now the beginning of our era. Very much the same periode as the writing of the Hermetic scriptures! And besides the PGM, there are also so-called Papyri Demoticae Magicae (PDM – also after the language they are written in). Many of the PGM and PDM were discovered in the 19th century by the earlier mentioned diplomat and book-collector d’Anastasi who bought them from an unknown man from Thebes in Egypt. Later other collections and seperate papyri were found or located. Unfornately even the d’Anastasi library didn’t remain together and was bought by different libraries in parts. The amount of papyri is still growing, but they are spread all over the world. Most of them where in the second Preisendanz translation, a few more in Betz, but since new texts keep popping up, a book will probably never be totally complete. As far as I know, Holmstrom is the only person who puts so much stress on the Babylonian side of the papyri and to the “voces magicae” I will come back lateron. Onto the papyri themselves then. 266 like with the Persians: grandparent of the the earth, Lord of all. 267 initiate me and put power into this thing (the ring which consecration this prayer is for) for my glorious life. Here we have a link between the Gnosticism and Egyptian magic and the PGM, but there is more. In the late 19th century E.A. Wallis Budge was conservator of Egyptian and other antiquities in the British Museum. As we saw earlier, in this time (1891) there were already books about the PGM, so they have been known for some time. Budge says in his book Egyptian Magic that the PGM are kept in the British Museum, so he surely had the possibility to study them like noone else. It is in the same book that Budge makes the link between Abraxas and the Metternichstele by the way. We come another step closer to the link Egyptian-Greek-Gnostic magic. In Budge’s Egyptian Magic he mentions the PGM when he speaks about papyri and amulets with “vowels […] in magical combinations” (p. 178).These “voces magicae” of Holmstrom are indeed to be found in the PGM quite frequently, especially PGM XIII is full of them. Such magical word-drawings are surely not exclusively Egyptian/Greek. Those of you who know the Nag Hammadi library will be familiar with the famous magical passages in for example the Hermetic Of the 8th and the 9th (celestial spheres) where long strings of vowels can be found within the text. And still, this isn’t an ‘Egyptian/Hermetic’ joke either, because in other Nag Hammadi texts, you can find these incantantions too, The Holy Book Of The Great Invisible Soul or The Gospel Of The Egyptians (NHC III.2 and IV.2) for example. This proves that there was substantial overlap between the Egyptian/Greek and the Egyptian/Gnostic/Hermetic kinds of magic. It is hard to say which influenced which, but my guess is that both stem from Egyptian magic and that secret names in diagrammetrical symbols were in use in ancient Egypt. This information continues for quite some time. It seems that certain letters belong to certain entities and the combinations, letters, but most likely sounds are to be used when a magician wants to call upon or use a certain (kind of) entity. Be sure to read the rest of this text when you are interested. It can be found online here. Van den Broek continues some more, but here we have the basis, seven vowels that form the secret name of God if written in certain figures. They should be pronounced in a certain way to be effective. The remark of the characters being musical notes is interesting. In my article about Angel Magic I give the origins of Western magic as follows: Egyptian/Babylonian magic passes through to Jewish magic which highly influences Christian, but especially medieval (Kabbalistic) magic. In the PGM I found more proof for this idea. Not all PGM texts are quite the same. Some are mostly prayers, others are for the consecration of stones or rings. Just a few that are in the books of Merkelbach and Totti have instructions of the conjuration of spiritual beings. These are much akin to instructions in medieval grimoires! 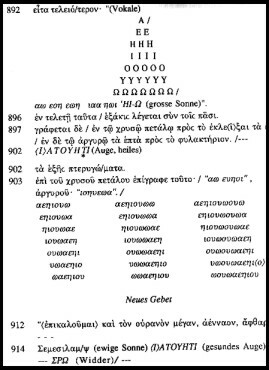 A striking element -for example-, is that already the Greek characters are interpreted as both letters and numbers and thus numerological values are ascribed to holy names (see for example PGM II.126). The clearest example is the often mentioned name Abrasax which numerological value is 365 and thus making Abrasax the god of life, or a year. Also much value is given to names of 4, or 6 or, 26, etc. letters. Coming back to the diagrammatical vowels, often these are holy names, in the same manner as the famous Kabbalistic tetragrammaton triangle. PGM II Dreamoracle through a dead spirit combines all these elements. It opens with three groups of vowels in “wingform” with the names “Santalala” and “Akrakanarba”. Then follows a hymn to Apollyon and a call to some demons. Also you get instructions for drinks and ceremonies, offerings, prayers, instructions for odours and even pressure-devices for stubborn spirits and moon-goddesses and times to perform things. All this reminds more than a little of medieval Western magical texts. All in all interesting texts to read. I noticed that that the complete translation in English is still available. I have a copy on its way, so this article be undergo more changes. Parts of the PGM, PGM, Mithraic liturgy and demotic papyri from Leiden and London can be found in English translations at the earlier mentioned site Hermetic.com. The complete Nag Hammadi library can be read online at Gnosis.com.